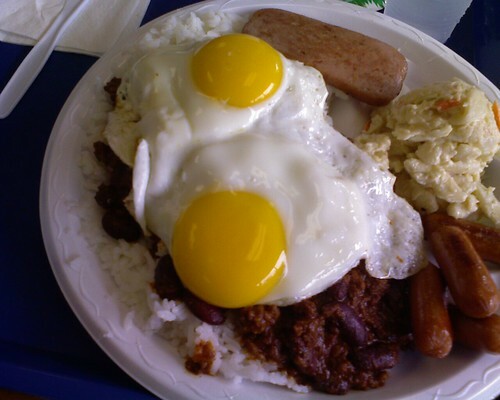 This entry was posted by James on Thursday, October 25th, 2007 at 12:34 pm	and is filed under CameraPhone, Hilo, Loco Moco, Plate Lunch. You can follow any responses to this entry through the RSS 2.0 feed. You can leave a response, or trackback from your own site. That photo made me hungry. Only $4.75?! Wow, you used your palm centro to shot that picture. Nice………….. Good old Cafe 100. Such memories. so whea da buggah rank on da rubio scale? Zippy’s has a chili loco moco, but I think this one from Cafe 100 looks just as good! Especially since I think I see Spam on the plate! Hi James – That is my wife’s favorite as well. Have you ever had a cheezy girl @ Cafe 100? I never got around to asking them what it was? Anyone? like a lock that a essential (i.e. a hormone) fits into. I am really loving the theme/design of your weblog. Do you ever run into any web browser compatibility problems? A small number of my blog readers have complained about my blog not working correctly in Explorer but looks great in Safari. Do you have any advice to help fix this problem?